Krishna House is a bed & breakfast homestay facility where you will experience genuine newari hospitality. Newars are the indigenious people of Kathmandu valley. Late Mrs.Krishna Mohini Prajapati, mother of the present operator conceptualized and founded Krishna House. At Krishna House we try to make you feel a part of our extended family, Rooms for you are airy,clean and facilitated with attached bathrooms. We have a common hall with mini library where you can relax and read. W-ifi is free. A terrace overlooking a garden is ideal for unwinding. A range of plants and trees, mostly indigenous offers natural ambience. Within few minutes of walk you will find yourself inside Bhaktapur - a medieval town alive with ancient culture and abundant art & architecture. In 10 minutes you will reach Bhaktapur Durbar Square - a world heritage site. Within couple of hours of leisurely walk through the villages you will be admiring Changu Narayan temple - a world heritage site from 4th century AD. 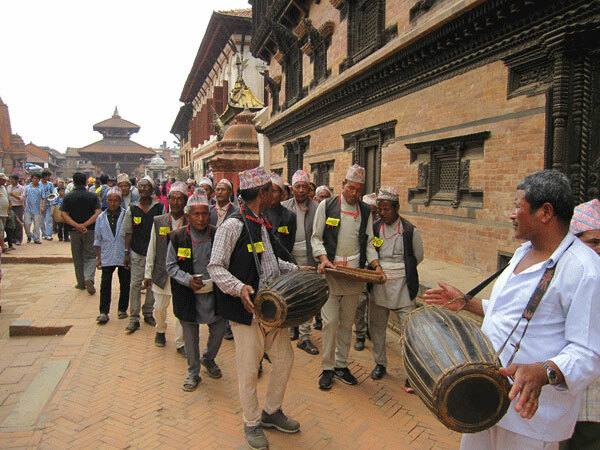 'Biskaa Jatra' a major festival in Bhaktapur continues for nine days in April, the time of good weather, spectacular mountain views and flowers. Thank you all so much for your kindness and hospitality. You have welcomed us into your home as family, and shared with us your knowledge of Hinduism, Buddism and trekking, as well as some delicious food (we loved the momos! ).